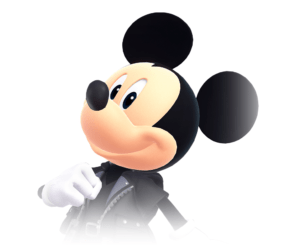 Here is Mickey Mouse's character profile in Kingdom Hearts. Included in his profile are some of his previous adventures in the past Kingdom Hearts games. Little is known of Mickey’s role in Kingdom Hearts 3, but fans are sure to be giddy with anticipation. The last time we saw Mickey was when he traveled into the World of Darkness alongside Riku. They tried to rescue Aqua from Master Xehanort’s control but were too late. This was seen in the Frozen World trailer which dropped back in E3 2018. In Kingdom Hearts χ, Mickey arrives in Daybreak Town with Chip and Dale right after Goofy and Donald’s Gummi Ship crashes into the Fountain Square. He helps save the player from being routed by the Wizard Heartless, the player having been assisting Goofy and Donald repair their Gummi Ship. After meeting with the player, Mickey senses Foreteller Invi monitoring him from a nearby rooftop. This makes him think that another force apart from his Star Shard brought him to Daybreak Town. Later, Mickey leaves with his friends and thanks the player for their assistance in rebuilding the Gummi Ship. Kingdom Hearts Birth by Sleep saw King Mickey undergo the Mark of Mastery Exam. This happens under the supervision of Yen Sid at the Mysterious Tower while Terra, Ventus, and Aqua search for Master Xehanort and Vanitas. Mickey runs away without Yen Sid´s permission during the Exam via a Star Shard that allows him to travel throughout other worlds. The Star Shard teleports him to the Keyblade Graveyard. Mickey then saves Ventus from Vanitas before being teleported back to Radiant Garden. 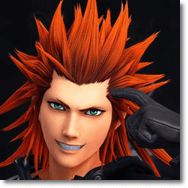 He is next seen teaming up with Aqua to save a young Kairi from the Unversed. Mickey is sent to Neverland after the battle, telling Aqua to not worry about him. While Mickey is exploring Neverland, Vanitas incapacitates him and takes him back to the Keyblade Graveyard. Ventus tries to help Mickey when he finds out about his role in Xehanort’s scheme, which results to the both of them being sucked into a vortex. Mickey is left stranded in space before Aqua finds him and carries him back to the Mysterious Tower. Mickey arrives later to battle Ventus after Vanitas fused back with Ventus. After they are all consumed, Mickey gets Aqua and Ventus back to the Mysterious Tower. At the tower, they discover that Ventus’s heart has left his body. At the end of the game, Mickey relinquishes the Star Shard and his Star Seeker Keyblade to Yen Sid. He feels that he has failed to reach his goal and disappointed his master. Before he leaves, though, Master Yen Sid gives the Keyblade back to Mickey. A smiling Yen Sid tells Mickey that he is indeed worthy of the title of Keyblade Master. 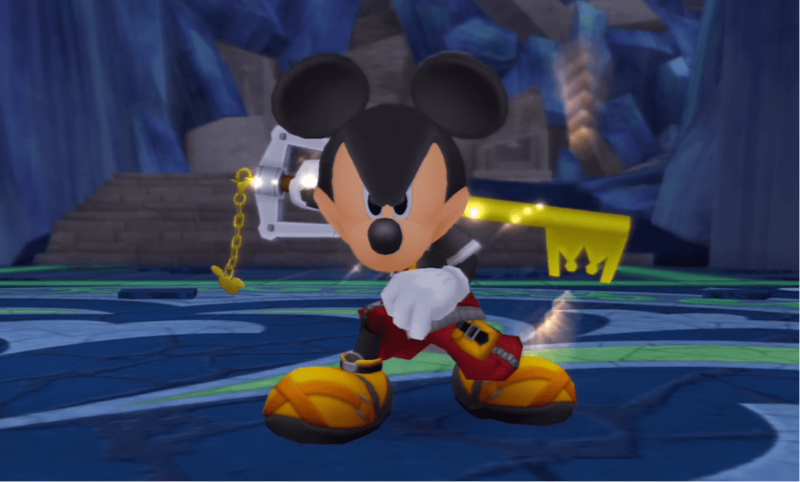 Mickey accepts both the Keyblade and the title of master. Mickey Mouse notices that several worlds have been blinking out one by one and becomes worried that all worlds could vanish from existence. He ventures off to investigate why this was happening and leaves a message with Pluto. His message was for Donald and Goofy, who he asks to find another Keyblade wielder in the other worlds. Mickey Mouse heads to Traverse Town, where he discovers a Corridor of Darkness. He goes through it, arriving in the Realm of Darkness where he finds the Dark Realm’s Keyblade. He acquires it, knowing the Keyblade is needed to close the Door to Darkness. He meets Riku in the Realm of Darkness. Riku explains to Mickey how the Door to Darkness functions and that they must close it to keep the Heartless from invading the Realm of Light. At the end of Kingdom Hearts, Mickey helps Sora in sealing Kingdom Hearts to prevent the Heartless from escaping it. Mickey and Riku opt to stay behind in the Realm of Darkness to ensure that no Heartless escape. This leads to Sora, Donald, and Goofy taking up a quest to find them and bring them home in the succeeding games. 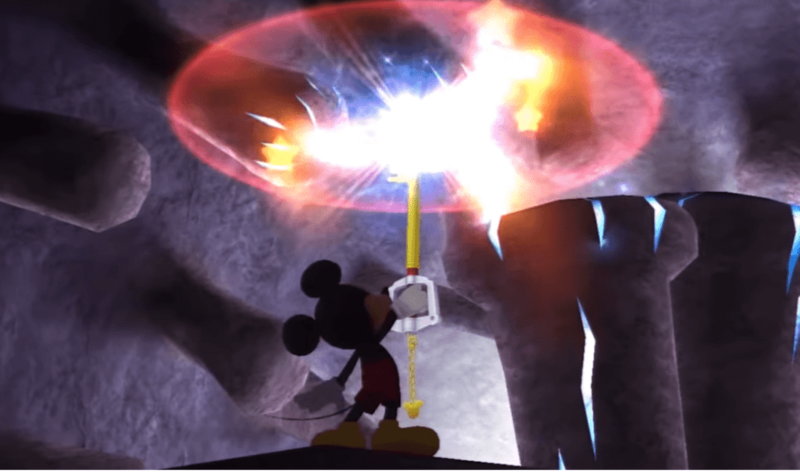 In Kingdom Hearts: Chain of Memories, Mickey, unable to fully phase back into the Realm of Light, appears as an orb of light to assist Riku when battling his inner darkness. Eventually, Mickey manages to escape the Realm of Darkness prior to his meeting with DiZ and Riku. Riku goes on to face Xehanort’s Heartless, but he requests Mickey promise to destroy him if Ansem conquers him. Mickey does not promise this, instead vowing to break through to his power and save Riku. Riku succeeds against Xehanort’s Heartless, but Ansem tries to trap him in darkness. Mickey brings Riku back to the light. This experience led Mickey to forge a bond with Riku similar to that of Donald and Goofy with Sora. After leaving the Castle, Mickey Mouse and Riku arrive in Hollow Bastion. Riku collapses, and Mickey tries to help him up. Riku refuses. Mickey and Riku go their separate ways, with Riku becoming increasingly worried about the remnants of Xehanort’s Heartless festering in his heart. He intends to be rid of the Heartless for good. King Mickey is seen in the Twilight Town woods battling Riku, who has taken on the form of Xehanort’s Heartless. Afterward, Riku ties a blindfold over his eyes which alters his appearance and catches Mickey Mouse off guard. Both of them promised not to tell Sora what happened to Riku when Sora wakes up. Kingdom Hearts 2 saw Mickey chancing upon Riku, who had just recently split from DiZ. Riku hands over the Munny Pouch that he stole from Roxas in the Simulated Twilight Town. Riku pleads with Mickey not to reveal his whereabouts or his condition to Sora and the others, to which Mickey reluctantly agrees. Posing as an Organization XIII member, Mickey assists Sora in defeating the Nobodies that attacked them in Twilight Town. He hands Sora the Munny Pouch Riku gave him and instructs him to visit his mentor, Yen Sid, after the fight. Yen Sid reveals to Sora and company why Mickey left Disney Castle in the first game: he went out to investigate the mysterious outbreak of Heartless and the more mysterious Organization. At the Hollow Bastion, Mickey reveals to Sora and company the truth about “Ansem” and the Door to Darkness, though is reluctant to reveal any information on Riku. Maleficent then summons a swarm of Heartless to destroy Radiant Garden. Mickey instructs Sora, Donald, and Goofy to leave Hollow Bastion and leave the Heartless to them. However, Donald and Goofy go against his orders when they realize how desperate Sora is to help Leon. He later confronts them after they defeat Demyx, at first appearing angry, but soon simply deciding to allow them to help. Goofy apparently dies after taking a nasty blow to the head from a boulder dislodged by the Heartless, saving Mickey from the same fate. At this, Mickey charges into the fray, followed by a similarly enraged Donald. After the fight, they are all relieved to discover that Goofy was only unconscious. When he and Sora confront Xemnas, Mickey remembers Xehanort’s name and leaps towards Xemnas into a corridor of darkness before it closed. This prevents Sora, Donald, and Goofy from going after him. Sora and the others later meet Mickey in Twilight Town. Here, they find a way into The World That Never Was through the Simulated Twilight Town DiZ had created. Upon entering the world, Mickey goes ahead of Sora in search of Ansem the Wise. He eventually finds Ansem the Wise, rescuing him from death. Ansem attempts to use his machine to convert Kingdom Hearts into data, but was unsuccessful and vanishes when the machine explodes. Mickey, Sora, Riku, Kairi, Donald, and Goofy face Xemnas as he opens Kingdom Hearts. Xemnas then blocks out King Mickey and Kairi from participating in the final fight by hurling a building at them. He then closes Kingdom Hearts and the dark portal to the Destiny Islands to prevent Mickey, Kairi, Donald, and Goofy from returning and assisting Sora and Riku. Following Sora and Riku’s fight with Xemnas, Mickey, Donald, Goofy, and Kairi wait for them on Destiny Islands. Once they arrive, Mickey runs towards Riku and congratulates them both for defeating Organization XIII. During the end credits, King Mickey is seen returning with Donald, Goofy, Scrooge McDuck, Huey, Dewey, Louie, Pluto, and Jiminy to Disney Castle, where he reunites with Queen Minnie. Jiminy asks Mickey to examine his journal about a mysterious message, which read: “Their hurting will be mended when you return to end it.” He instructs Chip and Dale to construct an examining computer to analyze the journal, believing that the memories written in it are still there even though the words are gone. The screen shows seven worlds from Sora’s first journey. However, the systems soon get glitchy, preventing further examination. Taking Goofy’s unintentional good advice to ask someone inside the journal to remove the bugs, Mickey decides to have a data version of Sora solve the problem. Mickey guides Data-Sora though Destiny Islands and gives advice on what the system’s problems are. Upon defeating the Darkside that was responsible for that world’s Bugs, Mickey saw a video of a memory that Jiminy never wrote in the Journal. Mickey is at the Mysterious Tower alongside Yen Sid. 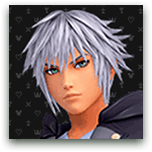 They are preparing Sora and Riku for their Mark of Mastery exam to restore the Sleeping Worlds back to be with the other worlds saved from the actions of “Ansem.” Doing so would allow them to obtain the power to fight Master Xehanort. As Sora and Riku encounter dream-based copies of Master Xehanort, Mickey receives a note from Maleficent. The message states that she has Minnie hostage and demands his return to Disney Castle. Mickey heads back to Disney Castle and discovers that Xehanort told Maleficent about the Princesses of Heart. Maleficent demands the Datascape from Mickey. He refuses and Lea’s sudden arrival forces Maleficent and Pete to fall back. 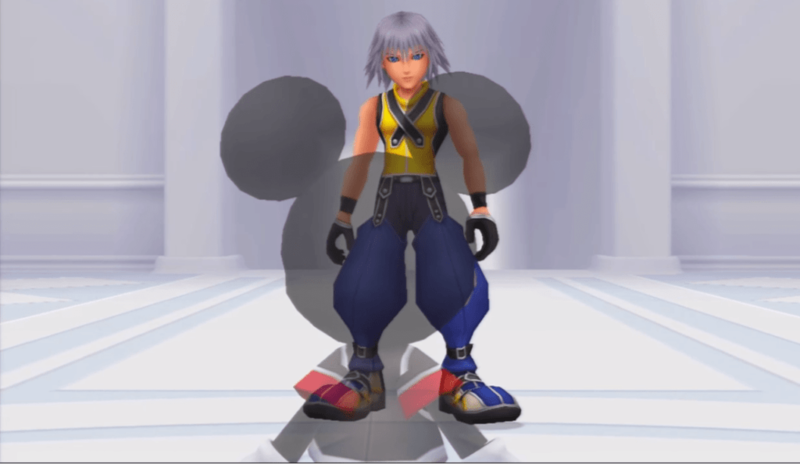 After bringing Lea to Yen Sid for Keyblade training, Mickey recalls Ansem possessing Riku when neither he nor Sora returned from the Sleeping Worlds. Mickey arrives at the World That Never Was to freeze the gathered Thirteen Darknesses. However, only Xehanort’s younger self is affected. After Xehanort’s physical form is restored, he explains his past schemes and his plans to recreate the χ-blade and restart the Keyblade War. Mickey accuses Master Xehanort of ruining the lives of Eraqus and his apprentices. 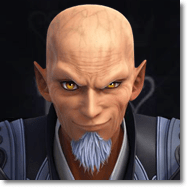 Xehanort merely scoffs and retorts that it was their destiny. He also divulges Terra’s fate to Mickey which emotionally distresses the king. This allows Xemnas to physically restrain Mickey from rescuing Sora before Lea, Donald, and Goofy turn the odds to their favor. Mickey helps bring Sora’s body back to the tower, offering to enter Sora’s dreams. Yen Sid tells Mickey that Riku is more suited to go inside Sora’s dreams, as they have a stronger bond. Soon after Riku is named a Keyblade Master and Lea is able to wield his own Keyblade, Mickey learns of the origins of the Princesses of Heart. He realizes that forming the Seven Lights would ensure the Princesses would not be targeted. 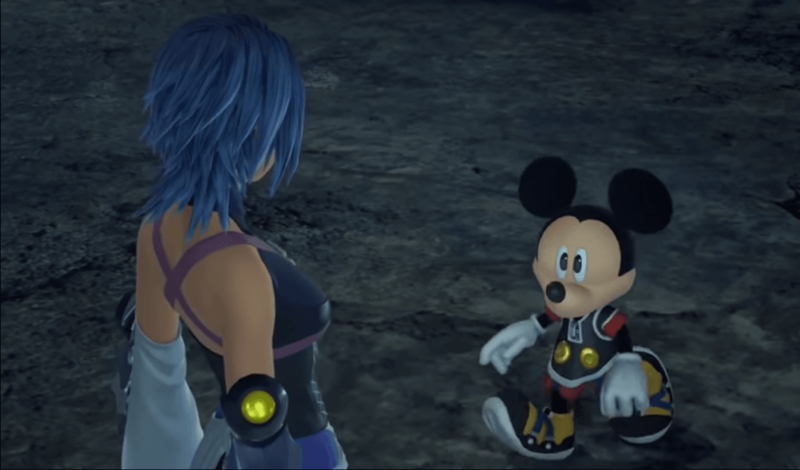 At the end of Dream Drop Distance, Mickey tells the tale of when he encountered Aqua in the Realm of Darkness during the events of Kingdom Hearts. Mickey comes to Aqua’s aid in the Realm of Darkness, assisting her in beating back the Demon Tower. He reveals to Aqua that it has been 10 years since the two of them had last met. He also explains that he had entered the Realm of Darkness via a Corridor of Darkness that appeared at the verge of a world’s destruction. Mickey then explains that he is seeking the Keyblade of the dark realm so that he and Sora can seal Kingdom Hearts. Mickey and Aqua continue their journey until they are transported to the remnants of Destiny Islands at the End of the World. After hearing Aqua’s story about Sora and Riku, Mickey posits that the Keyblade must be hidden nearby. He then leads Aqua to the Secret Place. before they are able to enter, however, the Demon Tide attacks and forces them into combat. They are able to repel the Demon Tide, and afterward, they enter the Secret Place. Mickey and Aqua open the door inside, revealing the Kingdom Key D. Mickey claims it for his own, which led to the islands vanishing and leaving the two of them in the Realm of Darkness. Upon traveling further into the Realm of Darkness, Mickey spots the door to Kingdom Hearts in the distance. Mickey and Aqua approach it and, upon closer examination, Mickey also notices Riku in the Realm of Darkness. He rushes to intercept his friend. However, Mickey is attacked once again by the Demon Tide. Aqua assists Mickey by attacking the Demon Tide. The Demon Tide takes hold of Aqua and drags her back to Destiny Islands and sealing the path behind her. Mickey, realizing that there was nothing left for him to do for Aqua, goes to seal Kingdom Hearts. The epilogue returns to the Mysterious Tower where Mickey has finished telling his story. Riku angrily lashes out at Mickey for not telling him about Aqua sooner, but Yen Sid dismisses Riku’s complaints. The wizard states that none of them then had the means necessary to rescue her and that telling them sooner would have had negative consequences. Mickey mentions to Riku of his plan that the two of them will need to rescue Aqua in order to gather the final pieces of the Seven Lights. Riku agrees to Mickey’s plan. Yen Sid bestows upon the two of them new garments that defend against the darkness before they depart for the Realm of Darkness.